The herringbone traction pattern of the Adidas Crazy BYW X is applauded by most because of its superb court grip and control. Most shoe owners love the comfort and impact absorption of the Boost cushioning. Buyers leave comments that the futuristic design of these athletic shoes from Adidas brings a lot of personality. The forefoot has minimal Boost and feels low-to-the-ground, claim some wearers. The Adidas Crazy BYW X fits true-to-size, say most reviewers. The compression collar at the heel and tongue areas amazes several shoe owners. They claim that it delivers a good amount of support and foot containment. For guards, the Adidas Crazy BYW X is a good fit. Its cushioning setup gives wearers a smooth heel-to-toe transition for quick cuts and crosses. The rubber outsole picks up a lot of dust and debris, say at least four reviewers. They have to wipe the outsoles from time to time during play. A lot of buyers think the Adidas Crazy BYW X is too expensive. The translucent outsole easily wears out, complain some users. A reviewer claims that the shoelaces of the Crazy BYW X comes loose easily. At least two testers claim the pull tab at the heel of these high-top sneakers for basketball causes chafing. If you have $200 to spare, the Adidas Crazy BYW X is totally worth it. This shoe is going to make head turns with its futuristic design and colorway. For daily activities and errands, the Crazy BYW X is going to keep your feet comfortable all day long. It can definitely keep the legs and knees from stress and fatigue. It's kinda weird... in a good way! I would say that this is one of the best performance shoes out right now. I think the Crazy BYW X is very good, but the traction definitely could be better. As much as I did enjoy playing in them, I still can’t get over their price tag. It has been bugging me the entire way. Even so, I’m still think that the Crazy BYW X is a solid performer and adidas did a great job of showing us a sneak peak of the hoop sneaker feature. However, the shoe has one pretty ugly flaw that a $200 product shouldn’t be having. Personally, I would love to see them priced at $160 or something in that price range. The Crazy BYW X is an Adidas Originals model that crosses over to performance basketball. The shoe model is formerly known as the Adidas Crazy BYW Lvl 1. On February 17, 2018, it had its limited release at $200 a pair in 747 Warehouse St. It is reported to be a revival of the Feet You Wear performance series from the 90s. It was first worn by Nick Young and Brandon Ingram in early February. The Crazy BYW X features a dual traction pattern, and a combination of translucent and solid rubber outsole, which never fails to deliver the court grip wearers need. For lockdown and support, the shoe model has a glove-like fit and strong nylon cables in its lacing system. The upper is made of deconstructed mesh and knit with bonded suede on the side panels. The breathable compression collar securely hugs the ankle. The wearer gets impact protection and comfort from the shoe’s Boost cushioning. For balling, however, the price of the Adidas Crazy BYW X might be too much, especially that the shoe cannot last a couple of games because of its frail outsole rubber. If only Adidas implemented a solid rubber with thick grooves at the heel, the $200 price would not have been a question. Adidas has plenty of other basketball shoes with the same or better structure and Boost cushioning. In such cases, the amount can be spent with recent and positively-reviewed basketball shoes. These include the sixteenth Nike LeBron James basketball sneakers and the super creative 33rd Michael Jordan basketball shoes. Cushion. The responsiveness of the Adidas Crazy BYW X comes from the Boost cushioning in its midsole. The forefoot area has thinner Boost for better court feel. The Boost at the heel is thicker for impact protection and comfort. This shoe model is also the first to have a black Boost at the heel. For a fluid heel-to-toe transition, the midfoot has a torsion plate. Traction. The outsole of the Crazy BYW X features a herringbone traction at the forefoot and a heat-mapped pattern at the heel. The rubber compound is part solid and part translucent. This setup is approved by a lot of reviewers as it provides better control for multidirectional footwork. The midfoot has a torsional plate and outriggers for stability. Length and Width. Although a small number of wearers claim that the shoe runs a little narrow and long, most reviewers advise new buyers to go true to their Adidas sizes. As for wearers with wide feet, they are advised to fit the Adidas Crazy BYW X first before purchasing. Lockdown. Aside from its one-to-one fit, the Adidas Crazy BYW X has a lacing system that is anchored on strong nylon cables that are attached to the midsole. When the laces are tightened, the cables grasp the foot better, further enhancing the shoe’s fit. The compression collar helps hold the foot down and secure it for side-to-side movements. The medial side of the shoe has a TPU piece which provides additional support. 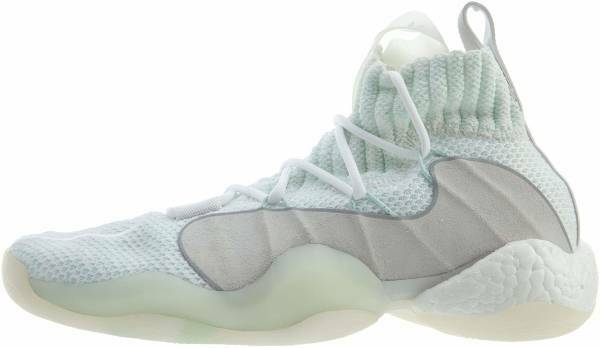 The upper of the Adidas Crazy BYW X is made of soft and form-fitting deconstructed knit and mesh. This setup help wick away moisture, and provide a comfort and flexible ride. The side panels have nubuck and suede overlays to give the shoe durability. The “adidas” callout is sandwiched between the Trefoil and Equipment Range logos at the top of the tongue. The Adidas Crazy Boost You Wear X is a low-top basketball shoe with a futuristic design and classic Boost cushioning. This shoe model is reported to be the revival of the Feet You Wear series made famous by Kobe Bryant in 1997 when he was still with Adidas. The top of the tongue and the ankle collar have dainty pull tabs to provide ease in putting on and removal. On the Adidas website, a number of wearers posted photos on how they wore the shoe. They pair it with short pants, blue jeans, black pants, and camouflage long pants. There is even one who wore the Crazy BYW X with tattered jeans. The Adidas Crazy BYW X was released only in one colorway - a black pair with blue and white outsole.